In the first installment of Marley Marl ‘Classic Recipes,’ he shows you how he produced the beat for the 1991 Grammy award-winning chart-topping single “Mama Said Knock You Out” by LL Cool J. He discusses the collaboration and the production process of the track, as well as methods and tools that were used, including the Akai MPC60 and E-Mu SP-1200, the preferred sampler and drum machine for most Hip Hop producers at that time. In this video Marley Marl loads the samples into his new production weapons of choice, Ableton Live and the Akai APC40, including bits of Sly And The Family Stone’s “Trip To Your Heart” and James Brown’s “Funky Drummer”. Throughout the video, the DJ legend gives invaluable advice and tips for young and up and coming producers, and he concludes the episode by offering a mixing technique for Ableton Live users and lovers of 808 kicks and other bass-heavy kick drums, and an alternate rock version of the song with never before heard lyrics recorded by LL in 1990. 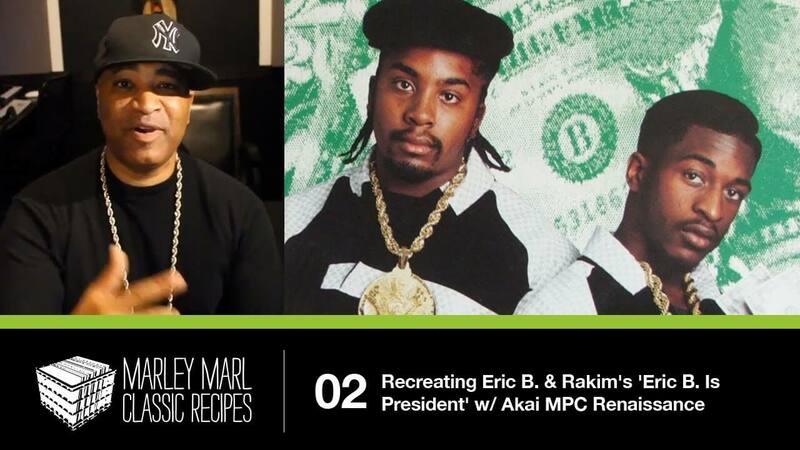 In the second installment of Marley Marl ‘Classic Recipes,’ he shows you how he produced “Eric B. Is President” in 1986, the debut single for legendary hip hop duo Eric B. & Rakim. Marl talks about meeting Rakim for the first time and discusses the collaborative process with Eric B. that would yield one of the most influential Hip Hop tracks ever. “Eric B. Is President” combines a bassline from Fonda Rae’s bonafide 1982 club hit “Over Like a Fat Rat” and a beat from James Brown’s 1974 hit “Funky President.” Putting these two parts together was a bit tricky due to differences in tempo, but Marley resolved this problem by replaying the bassline with his trusty Casio CZ-101 keyboard instead of just sampling it. In this episode of Classic Recipes, the legendary producer explains and demonstrates how he created the beat for MC Shan’s “The Bridge,” one of the most memorable beats in Hip Hop history. As always, along with the beat programming tips and composition/production techniques he also gives us the lowdown on where and when the music was originally created. Marl recalls the moment he first met MC Shan and recorded “Marley Marl Scratch,” and also remembers when legendary rap radio personality Mr. Magic rejected a Boogie Down Productions record that was submitted for airplay on WBLS-FM, later resulting in the feud between the South Bronx crew and Marl’s Juice Crew. “The Bridge” was originally created using the Roland TR-808 Rhythm Composer and the Korg SDD-2000 Sampling Digital Delay. Marley Marl programmed the beat by triggering drum sounds (the kick and snare) from the TR-808 into the SDD-2000, giving the track a unique sound and feel. In this fourth installment of Classic Recipes, the legendary DJ/producer Marley Marl explains and demonstrates how he produced and mixed the lead single off Biz Markie’s 1986 debut album Goin’ Off. Marl tells the story of how a young Biz, who was referred to at the time as The Diabolical Biz Markie and The Inhuman Orchestra, tracked him down in Queensbridge one weekend and introduced himself. When Marley Marl’s beats and melodies were combined with Biz Markie’s beat-boxing and rhymes, the chemistry was instantaneous. In this video Marley Marl reconstructed the beat from “Make The Music With Your Mouth, Biz” using the Akai MPC Renaissance. He uses his trusted kick and snare (The Honey Drippers’ “Impeach The President” intro drum beat) but this time around he has switched-up the beat pattern, using the hi-hats to create ghost notes. To complete the beat, Marl adds a sub-heavy, off-beat 808 kick drum, a sampled/sped-up piano melody from Issac Hayes, and some shakers which he created by recording his own voice.